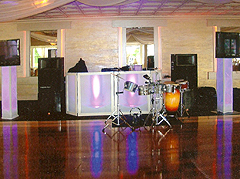 High Energy Entertainment DJ services has a dazzling colorful light show which can add fun and excitement to your celebration. 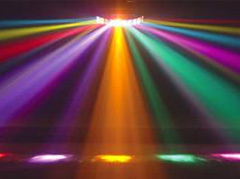 All lighting is sound activated with an array of different colors and patterns. 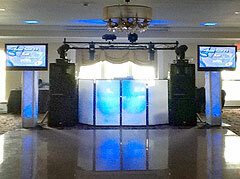 We offer everything from a basic light show to our deluxe intelligent light show for your special event. Make your wedding more romantic. Dancing on a cloud will give you romantic fairytale setting as you make your way onto the dance floor to share your first dance as husband and wife. 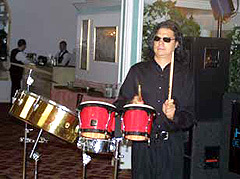 Consider hiring our Percussionist to perform at your Wedding or your next Corporate event. 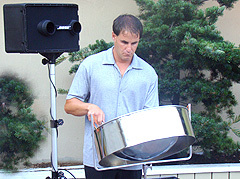 Include our Percussion Player to our team to add another dynamic personality to interact with your guests. Our Percussionist is a energetic performer with a musically trained ear in all styles, he will blend perfectly with our DJ. Are you planning an on-site wedding ceremony at your reception hall? 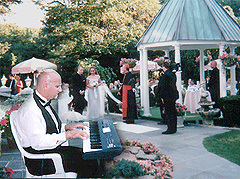 Our keyboard player would be the perfect complement for your ceremony music. Maybe you want live entertainment during your cocktail hour. A repertoire consisting of Frank Sinatra, Tony Bennett, Dean Martin, Louie Armstrong, Billy Joel, Elton John, The Beatles, Van Morrison and many other artists would create a perfect setting during your cocktail hour. Perfect setting for your Cocktail Hour, Beach Wedding, Tropical Theme Party, or your Corporate Event. Performing many types of Tropical Grooves, Calypso, Soca, Reggae, Buffet, and more! Do you want to add more excitement to your celebration? See your names or company logo in lights and create the perfect eye catcher. 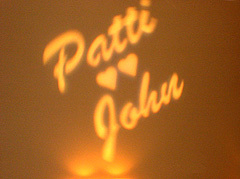 We create a custom gobo to be projected at your special occasion and have a keepsake memory to last a lifetime. 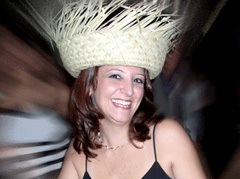 High Energy Entertainment offers thousands of party supplies, dance floor giveaways, event novelties, licensed paper goods, and theme accessories to enhance your party and accent its theme. We feature decorations, occasion gifts and favors. Plus, we offer the largest selection of party hats and headgear, inflatables, masks, noisemakers, jewelry, kits, sunglasses, and much more! For more information go to our Party Favors page. High Energy Entertainment can provide you with a karaoke show for your party, bringing out the fun in everyone! 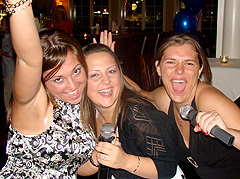 With our karaoke system you can sing like Frank Sinatra, Temptations, Gloria Gaynor, Rascal Flatts, Bon Jovi! We have a huge library of songs and any one will make you a star in front of your family and friends. Choose from our 42” plasma or our 6, 8 or 10 ft video screens. 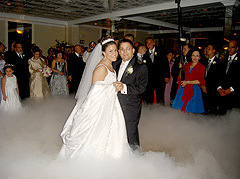 Our special effect Fog Machine produces streams of fog, perfect for creating a "Club Atmosphere" for your Sweet Sixteen, Graduation, or any other special event. 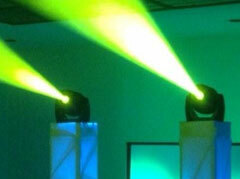 Fog machines greatly enhance any lighting by causing the beams to stand out. 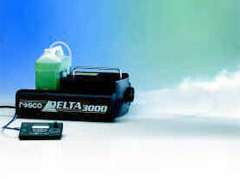 The addition of fog makes lights appear almost solid and columned, while greatly punctuating the effect of strobes and spots. No party is complete without bubbles! Bubbles are fun for all ages. Create a festive party atmosphere with thousands of bubbles floating around the room. Great for your Sweet Sixteen, Communion, Birthday, Outdoor Parties, and any other special event. 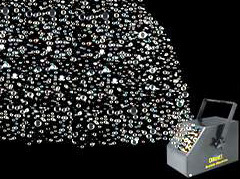 Bubbles are festive & fun, and our bubble machine will produce bubbles to enhance your special event. Our unique confetti will create a big sensation at your party. Perfect for Weddings, Sweet Sixteens, New Years Eve parties or any other special celebration - confetti can add excitement to every party! 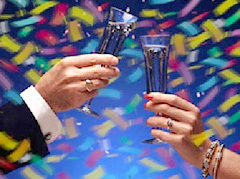 Let us enhance your festive event with bursting confetti and streamers to make a dazzling effect. High Energy Entertainment can add brightness and sparkle to any party with their balloons. 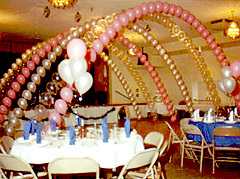 We offer a choice of latex or mylar, from table top or floor to ceiling. We do all types of balloon displays and arrangements for all types of occasions and events. LI's High Energy can customize any package to your budget and taste!